: a person who is very interested in technical subjects, computes, etc. Often mistaken for geeks, who aspire to become nerds yet lack the intelligence, and end up giving nerds a bad name due to their poor social skills. I was originally going to entitle this entry Tech Nerd, but after looking up definitions realized that the title would be a redundancy. As I have often said that I am a font of useless information, the “nerd” classification appears to fit quite well, although the word itself did not exist when I was in my formative years. But I digress. The actual subject matter of this piece is emerging technology, or more specifically, the hottest and most intriguing (at least to me) new entries exhibited in this year’s Consumer Electronics Show – CES to us fellow nerds. For those under a rock or who are basically not interested in this subject (if that is the case, you may want to stop reading this article now) CES is an international tradeshow for consumer electronics and technology that takes place every year in Las Vegas (ah the beautiful symmetry of subject and site). A veritable smorgasbord of amazing gadgets, big (and by big I mean gargantuan) and small, are showcased at this event – some leave you gasping with joy, others scratching your head. To illustrate the latter, the Petnet SmartFeeder connects to your smartphone allowing you to feed your pet remotely. Besides the fact that I would I never leave my beloved Jackson home alone without human supervision, unless this contraption can also take him for a walk, clean up his poop and rub his belly, I am not interested. No, this is not about Shakira’s song. Waka Waka is a company focused on creating renewable energy-based lighting and energy solutions. Since most technology that we own now operates on rechargeable batteries, what happens when those batteries run out of charge – say in a storm when our main sources of power can be knocked out? 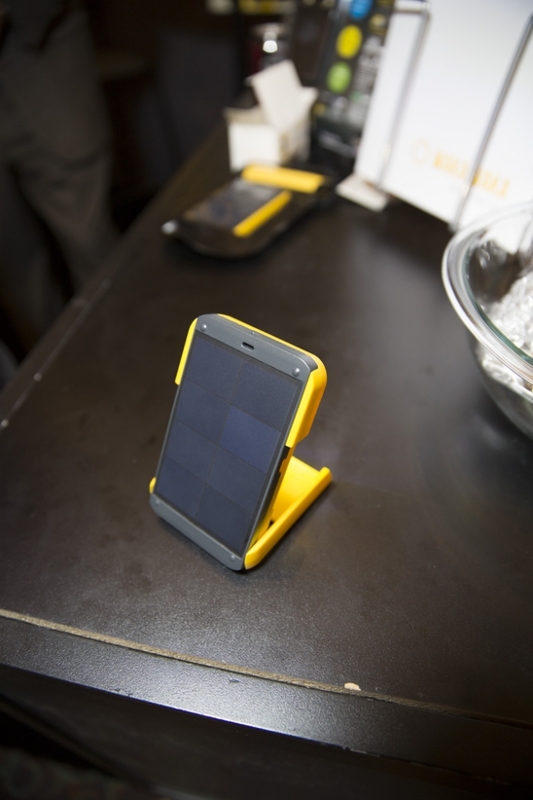 Waka Waka has developed solar base stations that convert solar energy into battery power for ANY device connected via USB. The base-5 model has 3 USB ports and can fully charge the equivalent of two iPhones after sitting 4-8 hours in the sun – the Base-10 model has 5 USB ports and can recharge 5 iPhones. At last, my own mini solar panels – cool! He may look like Ted, the crass but loveable character of the 2012 eponymous movie, but this little bear’s magic can be lifesaving. 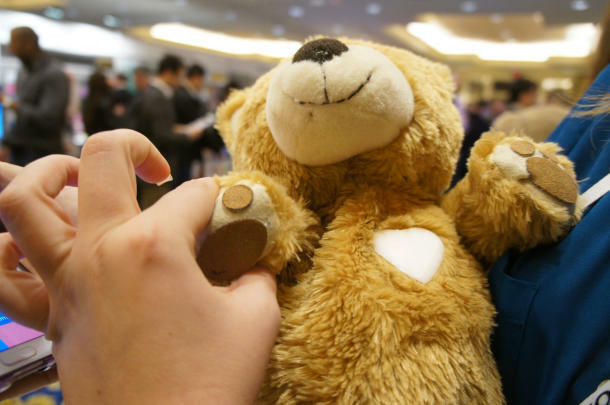 Crafted in two models, one for FDA approved hospital use, the other a consumer model, Teddy has a built-in pulse oximeter in his paw, for unwell kids or any person with fears of hospital equipment. The patient simply holds Teddy’s hand and their vitals are read. Teddy even has a little plastic heart that beats in time with the heart of the person holding his paw. Chills. Movie quotes and lyrics – another part of my font of useless information – for another article – time to sign off til next time! Please like the page, comment and share! And read my other posts too! Thanks. This entry was tagged nerd. Bookmark the permalink. Wow Cindy! Only your 3rd blog post and you are already boldly delving into a seriously controversial subject: Geek v Nerd. There is still no universally agreed upon definition, but I completely disagree with your assertion that geeks, and not nerds, are socially inept. In fact, social ineptitude is one of the characteristics shared by a huge majority of nerds, but not necessarily by geeks. I also take issue with your assertion that geeks are less intelligent than nerds. Ah, but we are working with conflicting definitions. To me “nerd” defines someone’s entire personality, while “geek” is more about a particular interest. So while many nerds are also science geeks or techno geeks, it is possible to be a geek and not a nerd. You could be a poetry geek, or a wine geek (like me) and not necessarily be a nerd. There are many sports geeks, who can recite batting averages for all of the 1969 Mets, but you won’t find a whole lot of nerds interested in sports (sorry nerds, chess is not a sport, even if you call yourselves a “team”). Because of this overlap you would find many nerds among the gadget geeks at the CES, but you would also find many non-nerd geeks obsessed with the latest technology. But as far as lack of social skills, I think there is a strong consensus that it is more of a nerd trait than a geek trait. Thanks for your comments Glenn. I originally thought nerds and geeks were interchangeable, but when I looked up definitions Webster’s and the Urban Dictionaries supplied the ones I used, so I guess you will have to take the debate to them :-). The true definition isn’t really germane to my main goal of illustrating the gadgets. I am content to be called either. The solar charger is brilliant! Love the solar charger!!!!! The future is bright with all these new gadgets! !